received tremendous recognition for developing a means of extracting a higher yield of tamoxifen, which is used to treat breast cancer, from Pacific Yew trees, which are home to white spotted owls. When the rest of the world was screaming “Save the Owls,” he found a way to “Save the Tatas,” using a natural product. Heretofore, I have unrelentingly eschewed ANY and EVERY multi-level marketing (MLM) scheme, including those involving essential oils (EOs). Part of my skepticism with EOs comes from my pharmacy background. Realizing, though, that Western Medicine is failing me in a major way, I thought back on my Natural Products class, where I learned that natural products WERE the first medicinals. Thus I began investigating a few EOs on my own. I’ve been known to add Thieves to my sinus rinses; and, though the experience is best described as “Fire in the hole,” it helps. I have found a few other oils that also help me with pain, both muscular and from osteoarthitis. My sister and daughter are both WAY ahead of me as regards EOs and have confirmed my findings and experience. Ultimately, I went with a budget and a shopping list to a friend who is affiliated with Young Living Essential Oils. Why did I choose Young Living? The pharmacist in me liked the fact that YL oils are therapeutic grade. Ditto their “Seed to Seal” commitment to purity and quality control; and Young Living’s commitment to sustainablity likewise appealed to the homesteader and goat farmer in me. In short, I am a bargain shopper; and though I had pretofore sworn NEVER to be affiliated with MLM, it was cheaper for me to sign on as a member and purchase the starter kit, which contains 11 EOs, a diffuser, and a few other things. I am anxious to start on oregano oil, which I purchased separately in hopes of getting my immune system back on track and ending this beaten path to the operating room! I have already used EOs in my herd. Most recently, I had a doe who freshened with 2 huge knots in her udder. Mastitis was a big concern, as they were warm to the touch and seemed to be tender. I was diligent to massage peppermint EO into her udder at every milking and at some point they disappeared. Peppermint acts as a vasodilator, allowing for increased blood flow to affected areas. I had forgotten about those knots until I got her first 2017 milk test results back. Her somatic cell count, an indicator of udder health, was an impressively low 1.7, as reported. Yesterday, I had JUST finished wiping down my kitchen counters with Young Living Thieves All Purpose Cleaner when I went to the barn and wiped out a bucket with 409 spray cleaner. I stopped, looked at the bottle, and asked myself “WHY?” When I go to such extremes to feed my goats non-GMO grain and hay, treat them with herbal products, etc., so that we can safely drink raw milk, WHY am I using harsh chemicals in their feed buckets? Suffice it to say, a spray bottle is on my shopping list so that I can take a bottle of Thieves All Purpose Cleaner to the barn for quick wipe downs where needed. research and providing accurate answers, not sales pitches. * I will not bombard you with reminders, private messages, enticements, pop-up parties, etc. I’m not offended by them. That’s just not my style. I believe that will get you the best bang for your buck; but I won’t “ride you” as some kind of team leader to achieve that dream vacation in LaLaLand. However, if we can help one another, please join me on my journey to wellness! How Can We Help Your Herd? We have 2 good milking lines, both of which conform well to breed standards as evidenced by performance in the show ring as well as LA scores. The does in one line, though, are easier to milk. My goal is to cross the two so as to reinforce production and yield a line of solid milkers that are ALL easy on the hands. How am I going about this? I'm glad you asked! Our most recent freshener, Delilah, is the daughter of Boca, a GCH who is a solid producer with lovely milk stand manners but is a bit more difficult to milk than our foundation doe, Waimea. Here's where buck selection applies. Boca was bred to Waimea's son, Rocky, who has been shown to improve on udders. Waimea shows well (2 legs, 1 BDIS, and a string of RGCH wins), has a permanent LA score of 90, and has earned her dairy star. However, Waimea does not produce as well as Boca. The intent of this breeding was to augment production and improve teat size in the offspring without giving up strengths from either line. SCORE! In comparing Rocky's daughter, Delilah, to her paternal grandam, Waimea, the difference in teat size is considerable. Waimea's teats are larger and easier to grasp. However, Delilah's teat size is improving gradually and is already an improvement over that of HER dam (Boca) as a first freshener. Likewise, Delilah's lateral attachments are an improvement over Boca's. As for general conformation, Delilah is a beautiful doe that combines the strengths of both her sire and dam. Delilah is not yet 3 weeks fresh and is nursing a single buckling. I've only been separating her from her kid and milking her in the morning for a few days. Each milking is easier on the hands and yields a bit more. This morning, I got a solid pint (weight: 0.77 lbs) from her with little effort. Last year, I brought in Proctor Hill Farm Troubadour *S, Delilah's second cousin on her sire's side, to further augment Boca's line. Troubadour's dam has an impressive udder and also has desirable genetics in her pedigree that I have further back in another doe and buck in my herd. I am anxious to get a daughter out of Delilah and Troubadour. High hopes.... Their little son is beautiful! I wethered him and will keep him as a buddy for a retained buckling. That will also give me an opportunity to follow growth and development from that pairing. In sum, our goal in selecting bucks is to breed for personable goats that conform well to the breed standard, produce abundantly, and are easy to milk - in all, a well-rounded animal worth the buyer's investment. We will be posting our 2014 kidding schedule soon. Please let us know if you see something that interests you! We cast our vote for the ND for numerous reasons. It's our understanding that they have the highest butterfat content overall and, relative to their size, give the highest yield. On average, they produce 3# of milk a day, although our Nutmeg produced a whopping 6.3 pounds on 1-day test last year. Her sister, Layla, is likewise a very milky doe. We have a family of 6. Our kids drink milk like water; and for YEARS, I bought 5 gallons of milk at a time. I was often told, "You need a cow!" We went through a gallon-plus a day. We started our herd of NDs in 2007. In 2008, before we really even had a clue (! ), we had 3 does in milk and milk coming out our ears! My boys, who had sworn "I'll never drink that stuff," were none the wiser when I started adding goat milk to the cow milk container. Before long they were drinking straight goat milk and only suspected the jug was mislabeled because it didn't "taste like skim." It's that good! What began as my daughter's 4H project (Raise your hand if you can relate!) grew into a more serious endeavor. We began to focus on a more "total package" line; and last year, with 4 does in milk, we had so much milk that it was hard to keep up with the supply. I make soap, cheese, yogurt, kefir, and ice cream, and we drink plenty of raw milk. Many a jar went to animals because I didn't know what else to do with it! With jars EVERYWHERE, I had risen to the title of "chief cook and BOTTLE WASHER." My life had new meaning. NDs are mild-tempered, endearing animals. My husband, who has oft said, "I said 'BOAT' not goat," surprised me entirely when he said late last year, "Maybe you and I will start showing." Typically, it's just been the "Dam and Daughter Duo" at shows. Miracles never cease. "Man, what a day. I am so incredibly blessed and thankful that God has more than granted EVERY goal that I set 6 years ago. I prayed for experience for vet school and have had way more than I ever expected. (If you want me to explain, block out about 6 hours of your time and I might be able to cover it all.) I prayed that I would attain 4-H All Stars and was just recently tapped in. As my interest in agriculture grew, I prayed that I would have a voice in promoting sustainable agriculture and just recently won a scholarship competition that will allow me to do so in November. I prayed that I would be able to raise just ONE homebred Master Champion before I transferred to VA Tech and now have TWO homebred champions! Above all, I prayed that He would be glorified throughout my 4-H experience, because I couldn't have done any of it without my Savior. In 6 years, I've met every single goal and, as a result of everything He's put me through in agriculture, I've had the awesome experience to share my testimony with tons of people. Since pretty much none of this has turned out as I planned, I completely understand Proverbs 16:9: "A man's heart plans his way, but the LORD directs his steps." Thank you to everyone who has helped me along the way, especially my spectacular family! :)"
To that I can only add "Soli Deo Gloria!" I'd also like to add my thanks to my other daughter, who gives enriched meaning to our phrase "Daughter Duo," and the men in our family who have likewise supported us in pursuit of this dream. To our mentors along the way, we are ever so grateful! "The daughter" first started her 4H project with 2 young Nigerian Dwarf goats. At first, feeding and caring for them and playing with them was satisfying enough for a young girl. In time, she took an interest in showing. After taking many a turn at the end of a class, placing 13th out of 15, 15th out of 16, etc., she began to note that many of the front runners were goats with the same herd name but different owners. Recognizing that anyone can buy a champion goat, she purposed to breed and raise her own. There were setbacks along the way, to be sure; and there came a time when she was ready to throw in the towel. After a long "argument" with God, however, she sensed Him saying, "You're not done until I say you're done." In obedience, she continued, crying "Abba 'Uncle'" and trusting His leading. Once she surrendered, things began to change. One by one her homebred goats began to pick up considerable wins. In her herd today, all but 2 goats bear our herd name. Six of her 8 does have at least one GR CH win and two have two wins each, putting them one GR CH win away from a permanent title. One of our second generation junior does, Delilah, also boasts a Best Jr Doe in Show win. Likewise, her brother, Comet, boasts a GR CH win and Best Buck in Show win. It's a rare day when a ND wins "Best in Show." Hence, you can imagine our excitement that 2 of our homebreds placed as such this year. Production has become increasingly important as we try to develop a herd that not only looks good but produces well. All five of the does we have tested on 1-day milk test have earned their dairy star. As her dam also earned her dairy star, Nutmeg is now a 2*M and produced a whopping 6.3 pounds on 1-day test. Next week, we will undergo Linear Appraisal for the first time, whereby each goat is evaluated and scored in 4 areas. It's both exciting and nerve-racking and we're just a wee bit anxious! Our greatest hope, though, is to find that the goats' scores will reflect positively on the job we've endeavored to do in caring for and raising them. After all, we are mere stewards; for the earth IS the Lord's and the fullness thereof. As 2011 draws to a close, we are pleased to present our 2011-2012 breeding and kidding schedule. Kidding season begins in a few short weeks when Boca Grande, who was again bred to Tur-Beauz Rocket, is due to kid. Last year this pair gave us an amazing set of triplets. Their daughter, Dancer, earned her junior leg as a Grand Champion JR Doe at the Virginia State Dairy Goat Association in June. Their son, Comet, placed as Junior Champion under all three judges at the Maryland Dairy Goat Association's 3-ring buck show. Not to be outdone by her offspring, Boca, likewise, earned her second leg as a Grand Champion SR Doe at the VSDGA show. We included both Dancer and Comet in our breeding program and are excited about seeing the next generation of Willow Pond Farm Nigerian Dwarf Dairy Goats. Watch for them in March and May. We were blessed to add some new genetics to our line this year. Our friends Mark and Angel Cole of Bannerfield Farm graciously allowed us to use their buck, CornerStone Farm STS Mark *S. Mark's sire, ARMCH Caesar's Villa CBS Stetson *S, represents the best of Nigerian Dwarf goats. We believe adding his genetics to our present mix will reinforce our aim of "Breeding for LegenDAIRY Conformation" as well as production that proves itself in the milk pail. Mark is bred to both Dancer and Nutmeg, who placed as Grand Champion SR Doe at the Prince William County Fair, where she was also awarded Best of Breed, Best Udder, and Best Doe in Show. We consider ourselves quite blessed here at Willow Pond Farm and are mindful that "Every good and perfect gift is from above, coming down from the Father of the heavenly lights, who does not change like shifting shadows." (James 1:17) As we anticipate the birth of baby goats in the barn, we are reminded that this is the season to celebrate the birth of a FAR greater gift - that of our Lord and Savior, Jesus Christ. There is none greater and we pray that His peace would fill your hearts and home during this Christmas season. HE alone is the "Reason for the Season." What began as a simple 4H project with just 2 goats has grown into a family endeavor to become self-sufficient and self-sustaining. We began with goat's milk as a substitute for store-bought milk. We learned to make soft cheese, yogurt, kefir, ice cream, sherbet, and even hard cheese. We learned to make soap from the milk and added chickens to our menagerie. We are learning to plant a garden of heirloom vegetables and harvest seeds that can be replanted. "The Daughter" was even selected to attend the VA Governor's School in Agriculture, where she learned much about sustainable agriculture. Coincidental? We think not. Increasingly, we are seeing that all we have learned is not just for our own enrichment. In Matthew 28:19, followers of Jesus Christ are commanded to "Go therefore and make disciples of all nations, baptizing them in the name of the Father and of the Son and of the Holy Spirit...." Few countries, however, will permit Christians to come in openly, though they welcome those who have something to teach native people. Increasingly, our family is seeing that as our HOME-educating years draw to a close, there are new teaching opportunities on the horizon. Our oldest son just returned from a mission trip to Mexico, where he preached to the poorest of the poor. He will likely be participating in another trip in October. Several possibilities exist for "The Dam" to take her soap making skills on the mission field; and "The Daughter" aspires to take her goat knowledge on the mission field as well. Perhaps an opportunity for a family mission trip will present itself. When it does, it's sure to be a LegenDAIRY Adventure! VALUE ADDED is the buzzword in the sustainable agriculture movement. As large-scale agribusiness swallows more and more independent farmers, those who are left in the dust realize that VALUE ADDED products are the key to survival. Just what does that mean, though; and how does it play out in the life of small-scale agriculturalists? Wikipedia defines VALUE ADDED as the "extra" feature(s) of an item of interest (product, service, person etc.) that go beyond the standard expectations and provide something "more" while adding little or nothing to its cost. VALUE ADDED is what we offer in our line of Willow Pond Farm Goat Milk Soap. Starting with our own dairy fresh milk, we add food grade palm, coconut, and olive oils to create a rich, nourishing base. Even the sodium hydroxide (lye) we use is food grade and comes from a reputable supplier. Some folks might balk to think a "harsh chemical" is used in our gentle soap; but I'll bet most folks don't realize that same sodium hydroxide (lye) is used in food production. Pretzels come most readily to my mind as a food item made with lye; and the fact is, soap without lye is really a lie. It's not possible to make soap without it. Finally, we add high quality essential oils and "scrubbies," as one friend has called them, before hand pouring our soap into molds. To suit customers needs, we offer a variety of scents and sizes and personally package each bar. Our prices are competitive and primarily reflect the cost of the ingredients themselves. The care we take in assuring the finest quality product results in a VALUE ADDED soap you will enjoy using and can give with confidence. I had not planned to make soap today. Extreme Makeover: Barn Edition is underway and we are still getting caught up in the yard and garden. However, when a bag of frozen milk fell out of the freezer and nearly landed on my foot, I had little choice but to clean out the freezer and do something with some of the milk stashed in there. The question then was what KIND of soap to make. I've been contemplating several different ideas for new soaps; but the decision was made for me when I came up short of the full amount of coconut oil needed for a regular batch. Stashed with my other soap supplies was a 1-ounce stick of cocoa butter, which I incorporated into my basic recipe. Since cocoa butter contains theobroma oil, the smell of chocolate was subtle but unmistakable; and with that, my mind was off and running. The result is a delight to the senses: espresso and cocoa marbled into a bar so heady with fragrance you'll be tempted to eat it! Marbled Mocha will be a great soap to keep on hand in the kitchen to wash away the smell of onion, garlic, and other lingering odors. Coarsely ground coffee beans enhance the fragrance and offer a scrubbing element as well. Look for this new addition to our LegenDAIRY lineup in another 4 weeks. ...to wake up in the morning and find that all 6 of your hens are now laying eggs. We are loving the farm fresh eggs. ...to watch one of your best does give birth to 3 healthy doe kids. We felt like we'd hit the Trifecta! ...to watch the seeds you planted in the chill of spring take hold in the earth and grow. Our heirloom tomatoes are really taking off! They will pair well with our cheese. ...to have an abundance of milk with which to make cheese and other dairy products. We are now making yogurt, kefir, chevre, and creme fraiche, which can be used to make delicious marscapone for use in canolis and tiramisu. ...to have fruit trees right in your own yard. Our cherry tree this year exploded. We've picked 3 large colandersful and made pie, jam, and even canned some. The blueberry bushes are starting to ripen, too; and the raspberries won't be far behind. ...to have a homebred goat AND her homebred daughter do well at a show. It's confirmation that the choices you're making are advancing your herd and taking you in the direction you'd hoped and prayed to go. Boca Grande needs only one more Grand Champion win to be a Master Champion. ...to have a buyer approach you about a goat just at the time you need to move it on. It's a reminder yet again that God's timing is perfect. ...to come in late of an evening after milking goats and wash the dirt away with your own handcrafted soap. The scent might "carry you away;" but there's really no place you'd rather be. Yes, life on the "farm" -- it's a good thing! Soli Deo Gloria! In this link, a comparison is made between traditional (commercial) bar soap and currently popular body wash: http://www.walletpop.com/2011/05/03/savings-experiment-will-body-wash-or-soap-get-you-cleaner/?icid=maing-grid7|main5|dl6|sec1_lnk3|60588. 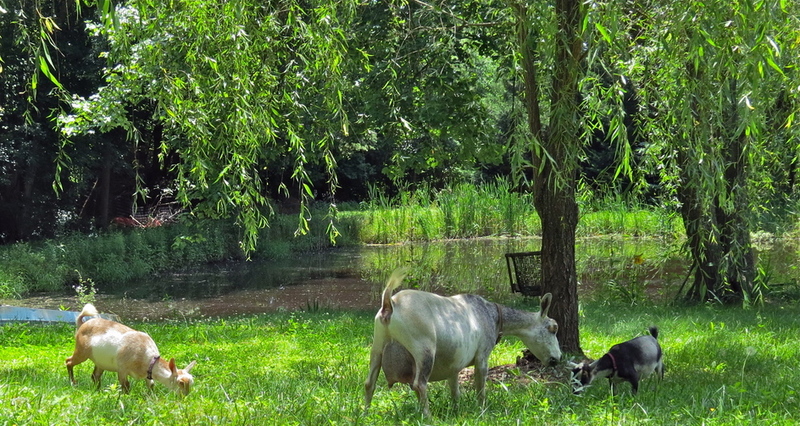 We believe our WILLOW POND FARM GOAT MILK SOAP to be superior to both. Our soap contains the rich fatty acids found in coconut, palm, and olive oils coupled with the neutral pH afforded naturally by the caprylic acid found in goat milk, which has a 6-8% fat content. In addition to the coconut, palm, and olive oils, goat milk helps to "superfat" our soap, making it even more gentle on your skin. Superfatting assures that the soap will not strip away the skin's natural oils which comprise the acid mantle, an invisible film on the skin that acts as a shield against bacteria, viruses, and other contaminants. Additionally, goat milk is rich in lactic acid, one of the alpha-hyrdoxy acids (AHAs) found in commercial beauty products designed to rejuvenate skin by sloughing off the outer layer of older skin cells. In short, our soap will get you clean, moisturize and protect your skin, AND save you money. We also offer reasonably priced soap saver trays that allow water to drain away from the soap, thus extending the longevity of our bars. What's not to love? Order your WILLOW POND FARM GOAT MILK SOAP today and see for yourself. Simply LegenDAIRY. Jamaican Me Calm - finally!! Cool Hand Cuke - Lingering odors will be washed from your hands by this blend of cucumber, melon, and cool citrus-basil. We've "upped" the citrus factor by adding dried lemon peel to help you scrub. Tea Tree TheraPea - You've read all about the therapeutic properties of tea tree oil. Now try our custom blend toned down just a bit by a delightful mix of sweet pea flowers, violets, and a light hint of sun-ripened berries. Stay tuned and mark your calenders for June 1 because this isn't the last of the new additions! Two months ago, our first set of quads were born. Tomorrow, three of them head to their new home. On April 19, we took our first order for Willow Pond Farm Goat Milk Soap; and in ten short days we've recouped 30% of our investment and taken orders from 4 different states. I'm almost tempted to get one of those "motor home maps" and color in the various states as we take and ship orders. On Wednesday, we introduced LegenDAIRY Linen and already have sold through nearly 2 batches. When the pace of life has you spinning, it's refreshing to know God has you in His grip. Soli Deo Gloria! I am blessed to say that our soap is being well received as it makes its way onto the market; and I am amazed at how fast I am selling through our initial inventory. There's a learning curve, to be sure, but I CAN do all things through Christ -- even run a successful venture. He hears my prayers; He guides my steps; He restores my soul - and oh, has it needed restoring. Thank you to all who have placed orders. Please continue to do so with the understanding that supplies may be limited for the next 6 weeks. I am endeavoring to find a balance that allows me to own a business without it owning me; and in the interim, life happens. Our best doe went into labor unexpectedly this week and the beautiful buckling she delivered didn't survive. That took some wind out of our sails and involved several trips to the state vet lab for testing on the kid to determine what went wrong. On the bright side, if this is an example of what our new buck "throws," I can't wait to see his next kids; and they are due in the next 6 weeks. Meanwhile, we have new owners coming next week to pick up their new doelings and there is still much to finish so that the girls are ready to go to their new homes. Once I'm back in the soap kitchen, I will have several new scents to offer. So keep watching! I hope not to keep you waiting too long. May your Easter be full of the wonder of His love. Oh, how He loves you and me! By the looks of my house, today might not seem to have been a productive day - mais au contraire, mes amis! With the kitchen to myself, I set about experimenting with a variety of fragrance oils and settled on 6 tantalizing new scents. The resident "sniffer extraordinaire" gave her nod of approval to all 6 and my husband and 2 friends concurred with the names and descriptions I gave them. They are catchy, to be sure, and suitably LegenDAIRY; but as none of these will be ready until later this summer, I won't taunt you now. Be on the lookout, though. With the labels already on order, new scents are apt to appear on the "Soap" page when you least expect them. Meanwhile, I'm still working on an actual order form and means of conducting business. Even though Amazon, with 2 physical operations in VA and MUCH to the chagrin of local vendors, refuses to obey the law, the Commonwealth requires me to collect sales tax even on internet sales. Amazon may flout the law; but they're better equipped to handle the repercussions than I am. In all probability, shipping will be flat rate USPS and handling charges quite minimal. I will most likely accept payment through PayPal; so if you don't already have a PayPal account - getcha one! Rest assured, however, that even without a PayPal account of your own, you will be able to direct funds to my PayPal account. I am looking forward to putting our soaps into your hands and homes and hope you'll enjoy using them as much as we've enjoyed making them. Milk is beginning to accumulate as we wait on more coconut and palm oil to arrive from the supplier. Yesterday we froze batches of milk to have ready for making soap when the oils arrive. Today, we're again trying our hand at making fresh mozzarella and it appears we've met with greater success! As with anything, practice makes perfect. Mozzarella was first made in the 12th century by monks at the Monastery of Saint Lorenzo di Capua.... Hmmm, something there rings a bell. The process involves gently mixing cheese curds with heated whey, then gently kneading and stretching the cheese to produce a delicate consistency throughout the cheese. It can be pinched and rounded into soft bite-sized balls or molded into a larger round for slicing. The latter is often used in ensalada caprese, a mouth-watering delight made with fresh mozzarella, sliced ripe tomatoes, pungent fresh basil, and a drizzle of balsamic vinaigrette. With all the heirloom tomatoes we're planting and 5 goats in milk, this dish is sure to find its way to our table many times this summer. Delizioso! Ahh! With the exception of the peppers, tomatoes, and herbs, the salad garden is planted. I don't think it's possible to plant a garden from seed and deny the existence of God. That ANYthing, let alone something edible, would grow from a speck the size of a period in size 20 font is nothing short of miraculous. Tomorrow, we have to plant pepper and tomato seeds in peat pots. We're about 3 weeks behind in that department; but with bars of soap drying all over the basement, there is no room for a grow light. We had little choice but to wait for the weather to warm up so the seed trays could be set on the deck. Friends who raise sheep have taught us that a lamb orphaned or rejected by its ewe is referred to as a "bummer." On occasion, we have had a doe reject one of its kids; and it's difficult to say why this happens. The kid looks fine to us; but for some reason, the doe discounts it. Often the rejected kid is the runt, the smallest kid in the bunch. In making soap, we've found ourselves saying "Oh, bummer!" on more than one occasion. Maybe it's because a particular bar wasn't cut straight or the bar is a little smaller than it should be. In other words, it just doesn't "measure up." Maybe it's because the soap didn't settle thoroughly into the mold as it was poured. The latter proved to be true with a batch of soap molded in bars with a raised motif of a standing goat. When I released the soap from the molds, I noticed some were missing part of a hoof or part of the goat's nose. I immediately thought of them as rejects or "bummers." Rather than rebatch them, I decided to call them BUMMER BARS and sell them at a discounted price. Watch for them. The concept of sheep and bummers brought to mind Jesus Christ, the Good Shepherd. God knows I don't "measure up." Romans 3:10 tells us "There is none righteous; no not one." Rather than say "Oh, bummer!" and reject me because of my flaws, Jesus drew me to Him. Rather than discount me, He paid the ultimate price for me and ransomed me through His atoning death on the cross. As it says in II Corinthians 5:21, "For our sake he made him to be sin who knew no sin, so that in him we might become the righteousness of God." He loves me like no other and has promised in His Word that He "will NEVER leave nor forsake" me (Hebrews 13:5). In the words of hymnist Philip P. Bliss, "Hallelujah! What a Savior!" ...I've told you a thousand times." Oh, how many times did I hear THAT growing up? It was usually followed with, "If you're going to do something, do it right." My father's wise words are deeply ingrained in me and to do something haphazardly just doesn't sit well with me. Such was the case with our first batch of Willow Breeze. Sure it smelled "LegenDAIRY" but I was not happy with the way it looked. It was somehow "splotchy." I wasn't satisfied until I melted it down, rebatched it, and repoured it into the molds. As I unmolded soap and cut bars today, it occurred to me that my father's words are really just another way of expressing Colossians 3:23, where we as believers are admonished to "work heartily, as for the Lord and not for men." Considering that all I do reflects on Christ, for good or for bad, I want to do this well - even if it is just making soap. I want only the best. I am deeply grateful to my earthly father for instilling in me a work ethic that has served me well. I'm even more grateful to my Heavenly Father, who has called me His own and provided a way for me to be truly clean. Today we released the names of the six soap scents that will be available in mid-May. Sizes range from 2-ounce guest or sample size to a hefty 4-ounce bar. The variety of shapes include simple bars, rustic round bars, and square bars with a raised goat motif. Limited quantities of more elaborate molded shapes will also be available. Prices have yet to be determined but are likely to range from $3.50 to $5.50 plus S&H, if applicable. Ideas are already swimming in our heads for additional scents. Wow...so many possibilities! The weather can't seem to make up its mind today; but I'm intent on pouring and getting a jump start on anticipated orders for our soap. I just finished pouring 4 quarts of maple-vanilla yogurt into jars and they are safely set aside to "incubate" in the oven. A gallon of yogurt disappears faster than one would imagine; it's just that good! While heating milk for the yogurt, I've been weighing out ingredients for another batch of soap. I've been peeking about in my cupboards, too, trying to envision different ingredients as additives. I'm weighing options as to what our signature scent will be and seem to have settled on "Willow Wisp." The fragrance oil I'm using contains hints of green tea and orange flower; and I'm toying with adding green tea leaves for their antioxidant properties and grated orange peel as an exfoliant. The possibilities are endless! I'm also pouring through images of sample labels and trying to decide on the general product name and how best to package our soap. With bars of assorted shapes and size, one size label may not fit all. Packaging is critical, as we want our soap to look as "LegenDAIRY" as it is! Maybe it's time to pour another cup of coffee and think more deeply on this one. The first batch of fudge is nearly gone; and according to the bathroom scale, that's a good thing! This was the first batch I'd ever attempted. Heretofore, my husband's all-time favorite fudge was made by the mother-in-law of his "Sister." (You know who you are!) By his rating, her fudge was ALWAYS a "10." For him to rate mine a "9" was a compliment indeed! It's likely the premium cocoa I used contributed to its rich flavor; but there's no doubt the butter-rich goat's milk was key to the creamy texture. It's a good thing our soap was so well received at my hairdresser's salon today. He has a 3-tiered basket stand that he wants to stock with our soap in assorted shapes, sizes, and scents. I laughed when, in reference to The Fabulous Beekman Boys, he called us The Lovely Lowery Ladies. With more milk going into soap production, there will be less time and milk available for fudge. No complaints there. When it's "through the lips and to the hips" we DON'T want to become LegenDAIRY in that regard! The last of our soap molds arrived today. We'll soon have an array of scents in assorted sizes. Are there any particular scents or added ingredients of interest to you? Please be sure to let us know. You can post comments to this blog. In the meantime, we're freezing milk in the appropriate quantity to have at the ready when time permits us to resume making soap. Wow! How did those pioneer women ever get it all done? We stayed out of the kitchen today and ventured into town to watch Clint Eastwood direct the shooting of a scene for the upcoming film, J. Edgar. How could we resist? At 81, he's pretty darn "LegenDAIRY!" We woke this morning to a light dusting of snow and cloudy skies that soon gave way to bright sunshine. With a fire blazing in the fireplace, it was a good day to attempt a batch of chocolate pecan fudge made with fresh goat's milk. I've always been told that fudge is best made when the humidity is low and today seemed like the perfect day to give it a try. We met with success and shared our sweet treat this evening with the ladies of I Eata Pie. If you live in the country, you know that the term "neighborhood" covers a wider terrain than it does elsewhere. I Eata Pie is a friendly group of "neighborhood" women who first gathered as an exploratory chapter of an established national social sorority. Many of us were approaching the "empty nest" years and glad for the opportunity to make new friends. However, we all agreed that memory work and ritual were not of much interest to us. Though we decided to disband from the national group, relationships had been forged and I Eata Pie became our new name. Several years have passed and the group has grown; yet it retains the pleasant and welcoming feeling with which it started. We also shared some herbed chevre with sun-dried tomatoes, which was well-received. What's left will be tossed with penne pasta and fresh basil tomorrow night for an easy supper. Together with a glass of red wine, crusty olive oil and rosemary bread will add the finishing touch. We left the ladies with samples of our newest soap: Secret Garden. It has a very pleasant scent that can only be described as "LegenDAIRY."